Hey, have you heard about Android Q? I am sharing the difference between Android Q vs Android Pie. We have also shared the latest 5 features in Android Smartphone. Soon Android Q will be available for Samsung, Mi, and other Smartphones. You can get this latest Android version on your Android Phone and other devices. Google has released the first beta version of Android Q. However, the name for the latest Android version [Android Q] is not defined right now. Also, there are some changes made in the latest version of the Android OS. A user who is having the Google Pixel phones can now easily use the beta version of the Android Q. When you will use it on your Smartphone. You will find some difference between Android Q and Android Pie (which you are currently using on your Pixel phone). But, hold on. Before you do so, have a look at the most necessary changes between Android Q and Android Pie. In this section, we will talk about the top five differences on Android Q vs Android Pie. Frankly, many changes are done by Google to make Android Q a brand new Android version. Everything regarding Android Q can be accessed on the official webpage of the Android Q LINK. But, here I have listed some most significant changes which you must look on them. So, let’s move on to the list of top 5 changes that has been done by Google in Android Q.
Google has changed the share menu in the Android Q. It is now a lot faster than it was on previous Android versions. The way of arrangement of the apps and shortcuts made it very eye catchy and attractive. Such that, one can use it if he or she is a beginner. Also, the most important thing which you will love is that you can now share a specific thing to multiple apps at once using the same menu. Where previously you have to do that individually by click on apps one by one and performing the same task again and again. If you remember then on previous Android versions whenever you take a screenshot on your phone then you do not get the notch in that. But, Google has changed it completely. On Android Q, whenever you will take a screenshot, then the notch will show up in the image which you have taken just now. However, most of the people are going to dislike it even I don’t like it as well. We have used many third parties theming apps to get a new look to our Android phone. But, the scene is completely changed in case of Android Q. This is a piece of good news for you guys that in Android Q you don’t have to use any kind of third party theming apps to get a new look for your Android phone. Yes, you heard perfectly right. Moreover, the thing which you must know is that currently, the developers are very less in this field, I mean the developers are countable in case of a theming option. Previously, on all the Android versions whenever you click on the notification, then you get only a few options regarding the notifications. But, here Google has included some more and important options so that the user can customize the notifications more easily. A user will now get more options like blocking notification, showing the notification silently, or keeping the alerts. Where on old Android versions there were only two options, whether to stop notifications or keep showing notifications, that’s it. The files app is completely changed in the Android Q. If you compare it with Android Pie, then you will not say that anything of the files app of Android Pie is same in the Android Q. It looks likes that Google wants to provide a completely new files app to the Android Q users as a surprise. Also, the new data app has a lot of the material designs in it which make it awesome and gives it a glossy look. There are tags such as videos, music, photos, and more at the top of the apps so that one can directly access that in one click. This was all about the differences between Android Q vs Android Pie. 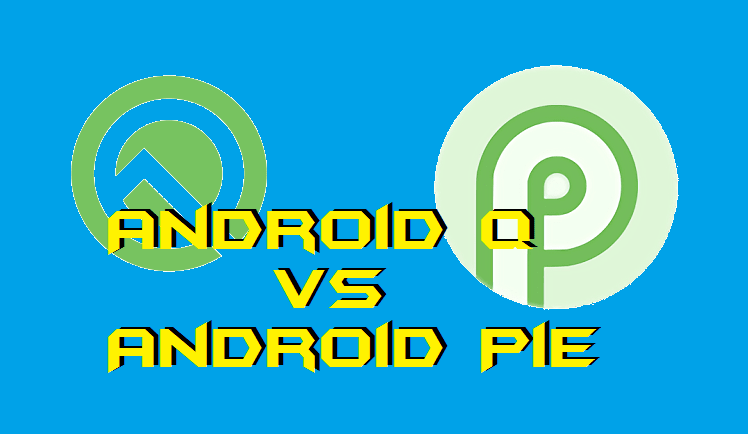 I hope that using this article you have now got the details regarding the changes between Android Q vs Android Pie. As you can see, here I have only discussed the top five differences between them. But, you can discover a lot more minor changes at the official website of Android. Share this article with your friends and family members so that they can also find out the differences between Android Q and Android Pie. Trending: How to Downgrade Android Version – Is it Possible?